Stamos Hotel Halkidiki is a family friendly budget hotel that offers bed and breakfast accommodation for families, couples and individuals. The hotel features an outdoor pool, a breakfast room, a café and a pool bar. The 18 guestrooms at the hotel offers excellent views of the sun, sand and sea. They come equipped with all the necessary amenities. The onsite breakfast room serves scrumptious variety of food from around the world. The café offers good coffee and light bites to take care of your hunger pangs between meals. Proximity to major tourists’ spots, beaches, shops and local market makes this property a hot destination for relaxing and fun holiday. The airport closest to Stamos Hotel Halkidiki is the Thessaloniki Airport at 75.3km. The Varkes beach and Afytos beach are 1km from the hotel. There are numerous attractions and things to do on the beach. Kallithea, a town known for its urban lifestyle, is only 3.1km from the hotel’s doorstep. Galata Tower is 6km, Stavronikitas Tower is 16.4km, the ruins of the Ancient City of Polygyros is 48.6km, Folklore Museum is only 450m, Kassandria, another lovely town is 6.9km, the turtle lake in Mavrobara is 16.4km, historical site of Mendi is 21.9km – are the places that you can visit during your stay at the Stamos Hotel Halkidiki. The Stamos Hotel Halkidiki features 18 guestrooms that are tastefully decorated with cheerful colours and comfortable furnishings. 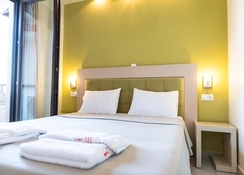 The guestrooms are divided into double, superior double, triple, quadruple and family rooms. All rooms, well-lit with bright sunshine filtering through large windows and balcony, come dressed with twin or double beds, telephone, satellite television, refrigerator, in-room safe box, private bathroom, and a kitchenette with cookware and coffeemaker. A few facilities such as laundry services, air conditioning and extra beds are also available on request with added local charges. 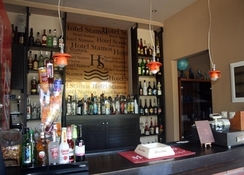 The Stamos Hotel Halkidiki is a bed and breakfast facility that serves rich and sumptuous Greek breakfast along with many other varieties of food. A pool bar serves alcoholic and non-alcoholic drinks along with light fare during daytime. There are many restaurants surrounding the property which offer rich and impressive menus other than local Cretan and Greek such as French, Italian, Asian (seafood), etc. Equally accessible are the various bars where you can find beverages from draught beer to black-labelled brands, located within a few paces from the hotel. On-site recreation includes a large outdoor swimming pool decked with sunbeds and parasols. However, the beach is down the road and accessible on foot. Once on the beach, you can enjoy water-sports, or simply lounge in the sunbeds. Alternatively, you can rent a bike and explore the nearby trails, go on a boat tour, dive into the sparkling blue water, or take a leisurely stroll on the beach lined with number of shops and bars.